On Saturday, August 18, before Cinema Under the Stars in Columbia Park, Deputy Mayor Ranganathan, Randy Engstrom and representatives from Capitol Hill, the Central District, and Uptown welcomed Seattle’s newest arts and cultural district, the Columbia Hillman Arts & Cultural District. Kathy Fowells, director at SEEDArts spoke eloquently about becoming the newest arts and cultural district and we wanted to share her words with everyone. I would like to acknowledge that we are on indigenous land, the traditional territories of the Coast Salish people. I’d also like to thank all the artists, and people representing the arts and cultural spaces in Columbia and Hillman Cities for working together throughout the application process. We’ve been working towards this designation for 2 years. You all should know that there were nearly 100 people involved in this process — it was truly grassroots organizing at its finest. As you may know, the 98118-zip code has become one of the most diverse regions in the nation. People from 40 ethnic groups call our neighborhoods home and speak 59 different languages. We are lucky to be able to experience these diverse cultures through their arts, performances, and cuisines right in our own backyard. Columbia and Hillman Cities have one of the densest populations of artists and musicians in our state. Our Creative Economy is strong and thriving. 10 years ago, the Washington State Arts Commission and the Western States Arts Federation worked together to form a tool called the Creative Vitality Index which tracks the impact of the creative economy in the state. The study tracks 36 occupational categories – including artists and musicians, photographers and filmmakers, dancers and authors. It also tracks revenue for arts organizations, businesses, and other data related to arts participation. The national Creative Vitality Index score is 1. The score for Washington State is .98 — just below the national average. Can you guess what our score is? It’s a whopping 1.83 – that’s nearly double the state score! According to their report, nearly 3,000 residents in SE Seattle hold creative jobs. In 2014, our local creative industries put $134 million dollars into the economy, and our cultural nonprofits contributed another $45 million. And that’s just in SE Seattle. Last weekend, I went to the San Jose Jazz Festival to see my brother, who is a jazz drummer in NYC, perform. As I was looking at the festival schedule, I was excited to see a Seattle band, the Delvon Lamarr Organ Trio, on the schedule. Their drummer is none other than our very own Dave McGraw, the owner of Columbia City Acupuncture. It was pretty cool to be in California — moving to beats from SE Seattle. It struck me that the arts of our neighborhood are so strong that even our local acupuncturist is a performing artist, and he’s representing us on stages all over the world. So why did we seek to become an arts and cultural district and what do we hope to accomplish? Our neighborhoods have embodied the creative spirit since they were founded. We want to ensure that arts continue to be strong presence in our community, and that our artists and arts spaces are protected. We know that rapid development is coming to the south end, and that we have a golden window of opportunity to guide this growth so that it is inclusive and supportive of our rich and diverse creative community. Our mission for the district is to celebrate and enhance the authentic and culturally diverse soul of Columbia City and Hillman City. We envision an inclusive, expansive and thriving creative community. What will this look like? And affordable commercial spaces for them to do business. And places for people from all of our diverse communities to enjoy their cultural traditions and share their stories through the arts. Each and every one of you has a role to play in supporting our Arts and Culture district. For many of you it means supporting the arts by attending events and exposing your kids to a wide range of arts experiences. This Arts and Culture district designation means that Columbia and Hillman Cities will continue to be a Creative Hub. A place where the creative economy can thrive, where artists are supported, and where neighbors have access to a variety of arts experiences. We understand that the arts are key to both community and economic development — and that a flourishing creative community makes our neighborhoods more livable, fun and beautiful. We are blessed with an incredibly rich diversity of peoples and cultures and art forms that make up the creative soul of the south end. The Seattle Office of Planning and Community Development (OPCD) is continuing to solicit feedback on the initial proposal to update Incentive Zoning. One of the options that they are hoping to solicit feedback on is adding a new option for developers to earn extra floor area by providing Cultural Space. This first round of public engagement is scheduled to continue until the end of September, so please share your thoughts and ideas with them around this exciting and important work. As part of this work, draft standards for all public amenities are now available on OPCD’s website. The Proposed Amenity Standards document contains proposed requirements for location, access, layout, landscaping, furnishings, and other areas for 10 public amenities, such as urban plazas, hillclimb assists, and public bathrooms, that can be used to achieve extra floor area. If you have any questions or comments on the Amenity Standards or the Incentive Zone Update, please contact Brennon Staley at brennon.staley@seattle.gov or (206) 684-4625. The more we know about your needs, the better we can create opportunities to serve you. We’ve asked you a lot about your cultural space needs, and we’ve spent five years designing policies, programs, and projects to address what we’ve heard. Your guidance to date has lead us to look at how a new independent organization, created by the City but living independently, could serve you and your cultural space needs. Help us define this new organization and target the opportunities it represents. Please take this simple survey and let us know more about how you interact with cultural space. This summer the Office of Arts & Culture published its long-anticipated CAP Report: 30 Ideas for the Creation, Activation, and Preservation of Cultural Space. The report sourced its ideas from the cultural community, the development community, from electeds, from departmental staff, and from consultants. In the short four months since its publication, the Arts Office, City Council, and the Mayor’s Office have already acted on four of its 30 recommendations, and continue to explore the remaining 26. The first of the 30 to see the light of day is Idea #3: Brand Cultural Space. Piloted in Capitol Hill, Seattle’s first of three Arts & Cultural Districts, this Cultural Space Brand is a medallion that officially recognizes cultural spaces in these arts-rich neighborhoods. The Brand is conceived as part of a wayfinding system, and designed to highlight the presence of cultural space, to aim people towards the arts, and to center cultural issues in neighborhood planning. The medallions themselves were designed by Kristen Ramirez, artists and Art & Enhancements Project Manager at Seattle Department of Transportation following a year of public community input, and created by a small local company. The second of the 30 ideas to be operationalized is Idea #23: Increase City Capital Funding for Cultural Spaces. For the past five years, the City has awarded small capital grants to cultural space projects through the Cultural Facilities Fund. While the total amount has varied year to year, the largest that fund has been in any year was $250,000. In 2018, we are proud to debut a newly reconceived and greatly expanded Cultural Facilities Fund with $1 million total assets to award. ARTS is in the process of running a Racial Equity Toolkit on the fund expansion, to ensure that the added resources equitably benefit communities of color, in recognition of the fact that these communities have been largely underinvested in the history of this country. That new fund will debut in early 2018. We are also proud to have worked closely with the Seattle Office of Planning and Community Development (OPCD) to activate Idea #4: Create an FAR (floor-to-area-ratio) Exemption and Bonus for Cultural Space. Piloted in the newly designated Uptown Arts & Cultural District, this mechanism will create an incentive for developers (without increasing heights) to embed cultural uses into their new projects. For every cultural square foot created, developers will be able to build additional market-rate square feet, helping subsidize the cultural uses in the building. Floor-to-Area Ratio incentives have long been used to encourage uses such as affordable housing, and are being leveraged here to meet another civic priority. Finally, to implement Idea #9: Reclassify Art Galleries as M Occupancies, we partnered with the Code Review team at the Seattle Department of Construction and Inspections (SDCI) to update Seattle’s Building Code. Art galleries in Seattle are designated as Assembly uses in the code, but their operations are far better aligned with other retail uses, officially called Mercantile uses. The difference, while technical and specialized, is that it is impossible to put an Assembly use into an older building without triggering a prohibitively complicated set of reviews for the whole structure. This change will make it possible to open an art gallery in an older building without, for example, re-wiring every space in the building, or re-insulating every wall (whether in the gallery or not). Most exciting about this particular change is Seattle’s opportunity, at the next biennial meeting, to pitch this to the International Building Code review panel, and potentially share this change internationally. ARTS continues to work on implementing the remaining recommendations from the CAP Report. Have you got a favorite idea? Reach out to us at arts.culture@seattle.gov and let us know what you think we should be working on. The Seattle Office of Arts & Culture’s (ARTS) Cultural Facilities Fund has expanded from $250,000 to $1,250,000 to better support capital projects for arts and cultural organizations in the City. The fund increase is in direct response to the needs to preserve cultural space and support affordability in a rapidly growing city. The Cultural Facilities Fund started in 2012 and is designed to support capital projects that improve Seattle’s arts spaces in significant and lasting ways. The fund’s goal is to help Seattle-based organizations build and improve their facilities in ways that will ultimately advance their missions and strengthen Seattle’s cultural scene by creating greater accessibility. In 2017 ARTS is undertaking a Racial Equity Toolkit for the Facilities Fund to ensure that the benefits it creates are shared equitably with communities of color, and that it helps vulnerable organizations fight growing displacement pressures. In addition to addressing the needs of the community through an increased facilities fund, ARTS’ Cultural Space program will host the annual Square Feet Seattle convening on October 16, 2017 at King Street Station to explore affordability and ownership models in the arts and cultural sector. Recommendations from the recently released “CAP Report: 30 Ideas for the Creation, Activation, and Preservation of Cultural Space,” will also be included. The CAP Report advances the city’s agenda of affordability and livability. The report seeks to define opportunities to increase cultural space, equitably support creative innovation, strengthen neighborhoods and preserve the culturally rich traditions of the city. The Office of Arts & Culture’s Cultural Space program preserves, creates and activates Seattle’s cultural square footage. To achieve this goal ARTS works with artists and cultural organizations to strengthen their role in charting the future of their creative spaces; works with developers and builders to incorporate arts and culture into new projects; and works with property owners to incentivize the preservation and expansion of arts and culture uses. SEATTLE (July 12, 2017) — Mayor Murray announced the Uptown Arts and Cultural District as the third neighborhood to be named a designated Arts & Cultural District. Uptown is one of Seattle’s most important cultural destinations with over 30 arts, cultural and educational organizations on the 74-acre Seattle Center campus and surrounding neighborhood cultural institutions, restaurants and retail. The Arts District designation recognizes the culturally rich neighborhood and seeks to enhance its character. development and measurement of our creative economy. The arts district designation includes access to the Creative Placemaking Toolkit, a suite of tools designed to preserve, strengthen, and expand arts and cultural spaces. The district will have access to $50,000 to be used towards the toolkit’s programs and resources for right-of-way identifiers, wayfinding, busking and plein air painting, art historic markers, pop-up activations, and parklets. The toolkit was designed to support artists, art-spaces, and neighborhoods in maintaining and investing in their cultural assets. Since the 1962 World’s Fair, Uptown has been a hub of Seattle arts and culture, drawing audiences and performers locally, national and internationally. Uptown offers the largest concentration of diverse arts and cultural organizations that range from independent artists, to internationally renowned classical arts, to innovative theater and visual arts, to ethnic festivals from around the world, to major music concerts. Uptown is a stage to celebrate the international diversity that is represented throughout Puget Sound. People come to the neighborhood to share the richness of music, dance, art and food found around the world. The creation of Arts & Cultural District program stems from the recommendations of the Cultural Overlay District Advisory Committee’s June 2009 report, which was accepted and endorsed by Seattle City Council with Resolution 31155 in August 2009. City Council found that a district plan benefits the city because arts and cultural activities serve as a major economic engine for Seattle, and provide an invaluable quality of life that other activities cannot duplicate. The program launched in November of 2014 with the adoption of City Council Resolution 31555 and the creation of the Capitol Hill Arts District. I am proud to present The CAP Report: 30 Ideas for the Creation, Activation, and Preservation of Cultural Space. Seattle is a dynamic arts and culture center. With 800 independent arts and culture venues in the city where Seattle can dance, listen, see, think, and absorb the rich creativity that courses through the arts community and energizes the city at large, we are now nationally recognized as an arts leader. Our breathtaking growth in recent years is a sign of that success, making it clear what a magnetic cultural hub we’ve become. However, our exponential growth has created challenges, including a serious strain on affordability. Ironically, the rising rents that have accompanied our success and growth, threaten the very cutting edge arts spaces and institutions that have made Seattle a dynamic destination city in the first place. To address our housing affordability crisis, my unprecedented Housing Affordability and Livability (HALA) legislation requires developers to contribute to affordable housing whenever they build. By coupling growth and affordability with progressive public policy like HALA, we will grow as an inclusive and equitable city. The arts are a vital component of the “Livability” in HALA’s policy mandate. Our mission to be an affordable, and therefore inclusive and equitable city, must emphasize the thriving arts culture that defines our community. In 2014 I instructed various departments to work collaboratively with the Arts Office and to engage with the community to develop solutions to the root issues that confront us as a thriving cultural center. What you see here is the result of that work. The ideas explored here to support Seattle’s invaluable arts community reflect a much broader commitment: Supporting Seattle’s arts is at its heart about supporting Seattle’s soul. And that means ensuring inclusion for the creative artists who make Seattle thrive. We look forward to your support of this developing project, and to working with you to refine the ideas contained herein. Together we will build a more inclusive Seattle. We will build a more equitable Seattle. We will build a more resilient, more culturally rich, and more artistically vital Seattle. We will build the Seattle that Seattleites deserve. SEATTLE (June 8, 2017) — The Seattle Office of Arts & Culture (ARTS) in partnership with over 40 organizations, city departments and individuals created The CAP Report, 30 ideas and recommendations for the creation, activation, and preservation of cultural space. Advancing the city’s agenda of housing affordability and livability, The CAP Report seeks to define opportunities to increase cultural space, equitably support creative innovation, strengthen neighborhoods and preserve the culturally rich traditions of the city. Included in the report’s seven areas of exploration are certifying cultural space, potential code changes, recommendations for the permitting process, and interdepartmental collaboration for technical assistance. All seven areas of action explore ideas that the City, developers and organizations could utilize to create, activate, and preserve cultural space. The CAP Report is an inspirational document and serves as a roadmap for the Office of Arts & Culture’s Cultural Space Program. The City is dedicated to exploring new ways to support the cultural vitality of the community including a number of ideas from the report. Several of the ideas generated in the report are a result of community outreach and will be explored by the City for feasibility. Certify Cultural Space: In the same vein as LEED certified buildings, there could be an innovative program that certifies buildings and individual specialists who create or preserve cultural space. The program could increase cultural space in development projects, strengthen neighborhood ties to businesses and preserve the culture and heritage of the community. Potential Code Changes: There are a number of opportunities to encourage the creation of cultural space in new and existing buildings with changes to the city’s building code. These changes could result in protecting arts and cultural venues who are vulnerable to development driven displacement and increase their viability. Permitting Process recommendations: Streamline and possibly subsidize the permitting process for cultural space, removing barriers to small, locally owned businesses. Technical assistance collaboration: ARTS is working on a series of technical tools to help developers interested in creating or incorporating cultural space. In addition ARTS is working with other city departments and community groups to provide resources to promote space making. Mayor Ed Murray delivered his 2017 Proposed Budget to the City Council yesterday, and I am pleased to inform you that he has proposed increased investments in arts and culture. The Office’s programing is made possible through the 1% for Art ordinance for public art, and Admissions Tax allocation. With his proposed 2017-2018 Budget, Mayor Murray has increased the share of dedicated Admissions Tax from 80% to 100%. Admissions Tax funds all grant, arts education, and cultural space projects and programs, as well as administration for the Office. Increased investment in our Equity work, funding both new programming and staff capacity that will address historic and current inequitable access to arts resources. We’ll also expand our partnership with Seattle Schools on The Creative Advantage, an initiative to put arts back into every classroom. This investment will develop a media arts skills center, which will expand access to creative careers for Seattle’s high school students. With this proposed budget, Mayor Murray has outlined increasing investment in youth, arts and cultural organizations and in cultural facilities. October 25, 2016, 5:30 p.m., Seattle City Hall in Council Chambers. Many thanks to you for your continued support of our city’s arts and cultural landscape, and to Mayor Murray for including these proposals as part of his 2017-18 Proposed Budget. (Seattle, WA) — In one of the fastest moving markets in the nation, Seattle arts groups are digging in for space activation. In the original home of the nation’s largest retail coop, and more recently a well-loved neighborhood Value Village, V2 is set to open. Occupying a classic Pike-Pine auto row building, V2 will temporarily bring 30,000 new square feet of arts space to Seattle’s Capitol Hill. An initiative of the Capitol Hill Arts District, managed by Velocity, V2 will house programs for a number of resident arts organizations, as well as special events in this stunning, light-filled space. Velocity secured the lease with property owner Legacy Commercial, will provide overall management for the space, and oversee bookings as part of its ongoing commitment to community activation on the Hill. A truly collaborative project, V2 will house the theater lights and seating for neighboring Hugo House while their new home is built, with furniture donated by PEMCO insurance. Seattle Center is donating a portable dance floor to Velocity to cover the uneven surfaces on the ground floor. 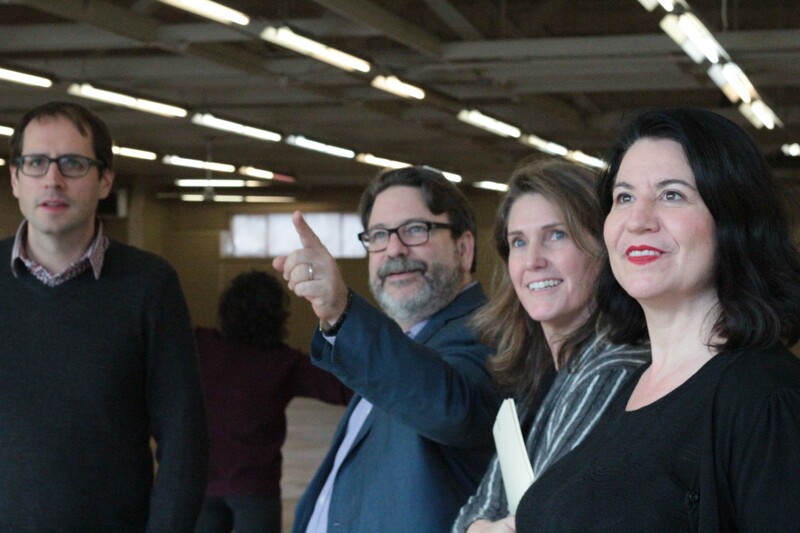 Velocity will use the space to meet the growing space needs of its Creative Residencies, producing programs, and international summer festival. One Reel will relocate its offices to the top floor and members of the Capitol Hill Arts District will be activating the downstairs stage and windows. V2 will provide low-cost rental space in the center of the Capitol Hill Arts District and a gathering place for rehearsals, events, artist residencies, community forums and the monthly Second Thursday Art Walk. Property owner Legacy Commercial is generously offering the space extremely below market rent for a short term, until the building is redeveloped. V2 is tentatively scheduled to open in early March 2016. For information about renting the space contact Velocity at cait@velocitydancecenter.org. Interested in volunteering? Sign up HERE.